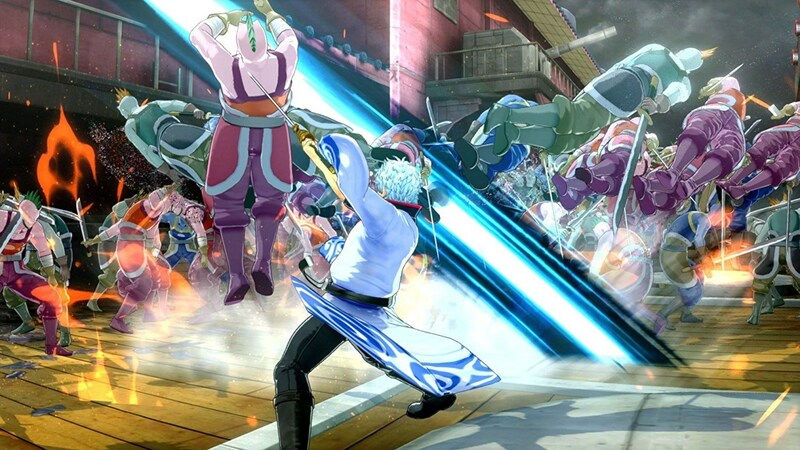 Gintama Rumble is a 3D action game developed by Tamsoft of Senran Kagura and Onechanbara fame and it seems to be in line with the Musou or Dynasty Warriors-styled games. 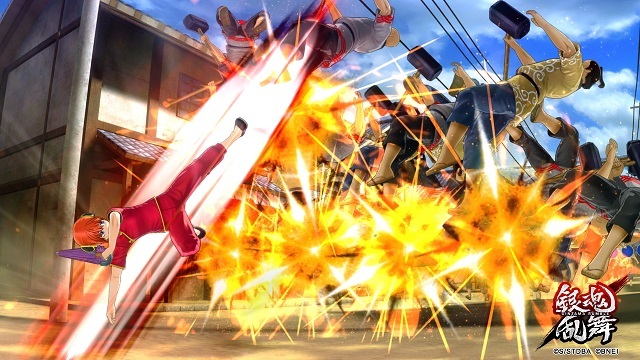 Gintama Rumble is fairly standard fare as you play as a character who fights hundreds of enemies in a particular level, liberates some camps and fights a boss here and there. To be honest, Gintama Rumble doesn’t really do a whole lot to differentiate itself from the dozens of Musou or Musou-style games out there. For those of you that are unaware of Gintama, it is a fairly long running manga and anime series that is known for being off-the-walls insane with plenty of fourth wall breaking jokes and filled to the brim with anime and video game references while telling a surprisingly compelling and dark story. 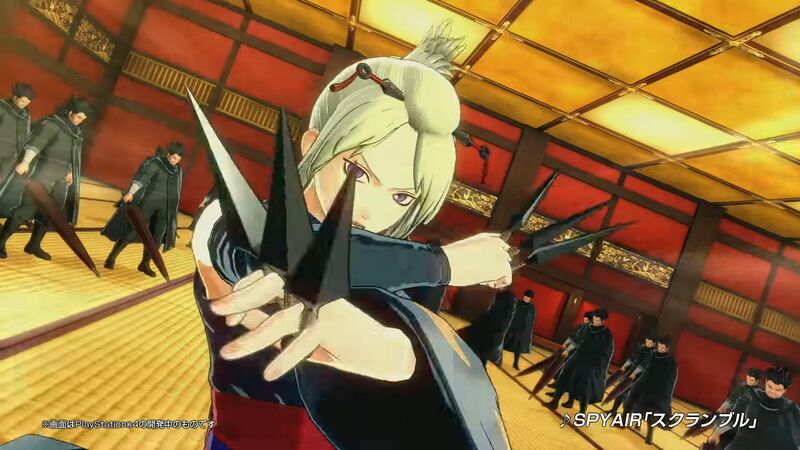 Unfortunately because Gintama Rumble sticks so close to the standard Musou formula, it seems to be lacking that “Gintama Flavor” that fans have come to love….at least initially. The main mode available to you is the Gintama Chronicle mode. Here, you play through various serious arcs in the Gintama series starting with the Benizakura arc and going up until right before the current Silver Soul Arc. The story mode is made up of two types of scenes, the adventure mode which is a visual novel style mode that recaps the story over a voiced narration using CG from the anime and the battle mode which is when you actually get to play it. As a fan of the show, I can appreciate them using the CGs from the anime, as many of them brought back memories of watching those particular episodes. However, there are some quirks about it that may not sit well with gamers or those of you not familiar with the show. Since the CGs are directly ripped from the anime, many of the ones from the earlier arcs are in 4:3 because after all, Gintama premiered way back in 2006 before 16:9 became a more commonplace standard for television broadcasts, so as a result, they can look a bit inconsistent. It also doesn’t help that Gintama over the years has improved their art and animation significantly, so the later arcs look a LOT better and the character art was far more detailed. It really just goes to show you how far they have come over the last 12 years. Also some of the CGs that they picked are shown completely out of context even going as far as showing some joke punchlines without the narration mentioning the actual joke itself. For someone like me who has seen the anime and read a good amount of the manga, this isn’t much of an issue but I can imagine other players being very confused or lost at some spots. Another big issue with the story mode is that you do not get the full ending of an arc unless you complete all of the achievements in that particular chapter. I’ll come back to those achievements later. Something else I should note with the game’s presentation is that some of the menus had text that gets cut off by the screen. It could be my display and maybe adjusting the settings could help this, but I figured I would mention that. Before a battle, you are given an opportunity to customize your character. You can assign assist characters, spend skill points to increase your attributes, and change your character’s clothing. Of course you will see a map of the stage and the win/lose conditions along with three achievements. These achievements include tasks such as: ‘beat X amount of enemies’, ‘complete the stage with a certain amount of health’ or ‘defeat the boss with a super move’. While I like these as extra incentives to go back and finish the levels, I think it’s a bit excessive to make them necessary for seeing a chapter’s ending. Stages usually have three of them so you need to complete every one of them in order to see that arc’s ending, however it isn’t necessary to progress to the next chapter of the game. During gameplay, your character can use a weak attack, a strong attack and a “hurricane” attack which is usually a thrust move that doesn’t really damage enemies but is helpful as a combo extender and can briefly stun your opponents. In the stages, there are various camps you need to liberate by defeating a certain amount of enemies in close proximity, lowering the enemy’s morale. Once it gets low enough a captain shows up, defeat them and the area is liberated. You may also have to travel to certain locations on the map for the level to progress as well. During the stages there are many lines spoken by the protagonists to further the storyline however they come out of the Dualshock’s speaker instead of the television’s which is kind of weird. I think the idea was to separate the BGM volume and the voiced dialogue, but unfortunately that also means that it’s very easy for the BGM to overpower the voice acting so you’re going to want to go into the main menu to configure the volume levels accordingly. As for the voice acting itself, it’s the same cast from the show that we know and love. As far as I know, Tomokazu Sugita IS Gintoki and I have a hard time accepting anyone else, though I will give a shout out to Shun Oguri who didn’t do a bad job in the recent live action film adaptation. You fight a LOT of enemies in this game but your moveset is VERY limited and honestly, it made the game feel a lot more repetitive than it really should have. You can unlock more abilities by allocating skill points in the intermission screens after you level up. There are three categories you can spend points on – strength, skill, and spirit. Skill is the category that will unlock those extra moves, so I highly recommend prioritizing that, because otherwise you are in for a VERY monotonous game. I didn’t realize just how much smoother the game becomes once you unlock the extra moves, especially the final one as it not only gives your character a new move but adds a whole new mechanic to the game in general by adding a new special move meter. I didn’t unlock this until after I finished the game and went back and did some levels because I invested points in other categories and regret not doing so during my initial playthrough, as that would have made many of the levels go by lot faster. Do not make this mistake! Every now and then in the level you will be given a challenge such as keeping up a combo, going a minute without taking damage, using a special move or defeating a bunch of enemies quickly. If you complete this challenge, you activate the “Ginpachinko” which is a slot machine that will give you a random status effect. These can range from bonus experience, your awakening gauge being filled, or even a temporary buff in attack strength. While this does add some variety to the levels, it does take up the whole screen and the action is not paused, so it can be easy for enemies to get in some cheap shots while this is happening. As you progress throughout the levels you may reach some cutscenes but the majority of those are using the CGs from the anime that I mentioned earlier. In some of the later arcs we are treated to some more cutscenes using the in-game engine which look great, but it just makes you wish there was more of that and less of the anime CGs. 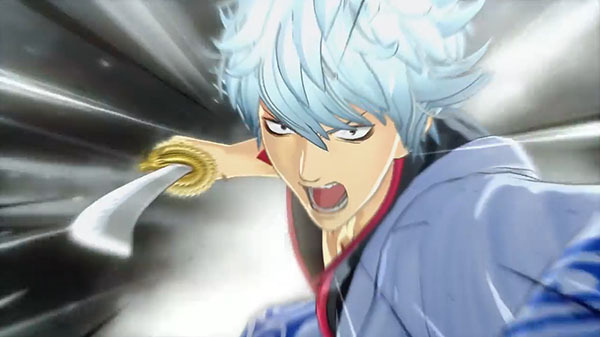 The main story arcs included in Gintama Rumble include the series’ more serious ones such as the aforementioned Benizakura Arc, the Yoshiwara in Flames arc, and the Four Devas arc among many others. 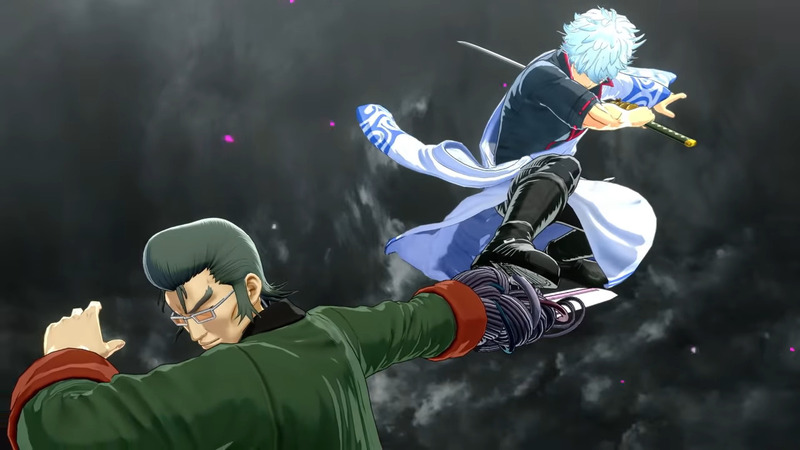 Some arcs lend themselves better to the Musou gameplay and as a result those chapters are more fun, but for Gintama fans hoping to get some of the more humorous arcs adapted you might be a bit disappointed. You also spend most of the levels playing as Gintoki despite the fact that you do unlock a lot of other characters and they have very distinct playing styles, such as Katsura who uses explosives, or Tsukuyo who is fast and is very projectile focused. It’s a shame that you don’t get to spend more time with them because otherwise that could have done wonders for adding more variety to the main story mode. What is nice is that you periodically unlock some side chapters that feature the other characters and are filled with some funny commentary on the series as a whole. For instance in the Benizakura side chapter Katsura goes on a rant about how Gintama fans are sick of the Benizakura arc being shoved down our throats considering it was given two film adaptations. For as tedious as the main story can be at times, the ending is absolutely hilarious and exactly the kind of humor a fan of the series would expect and have been hoping to see in this game. The problem with that particular scene though is that it portrays Gintama charm, something that is overall lacking in the main campaign. The game is very straightforward and serious which, for a series that is known for having a great balance between humorous and serious storytelling, this came off as a bit jarring. However, all is not lost as completing the game unlocks the Ultimate Rumble mode. This mode is amazing! it’s a much shorter campaign that can be considered an arcade mode of sorts. Basically it’s a tournament and each character is trying to win with their own motivations for participating and ending. The levels are pretty much the same as in the main story mode. Where it gets fun is that the levels introduce all sorts of weird and crazy obstacles. These can include the game literally glitching the graphics like crazy or “censoring” out certain characters on the map or your character gaining a powerup that transforms them into a Cell look-a-like while Dragon Ball Z-esque music is playing in the background. All the while, the main characters are freaking out and commenting on the absurdity of it all completely shattering the fourth wall and going as far as calling Bandai Namco out on their horrible programming mid-battle. See, THIS is Gintama. This is the kind of stuff I was hoping to see in the main story. The fact that such an interesting mode which accurately portrays what makes Gintama so enjoyable to fans is locked like this is just crazy. I can understand wanting to focus on the serious arcs as a way to recap the storyline, but in my opinion they didn’t really do a great job with that either. Gintama fans already know the story and people who are looking to get into Gintama by playing this are going to be completely lost because it doesn’t do a great job explaining the story considering how many of the CGs are shown out of context and even worse, they are forced to do every achievement in order to see how each arc ends. It just feels like so much unnecessary work to unlock something that may not even mean much to people who aren’t already die-hard fans of the series. 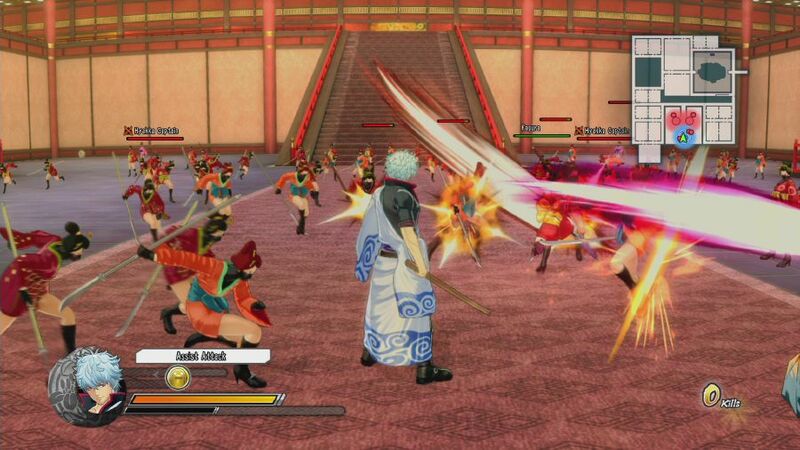 Gintama Rumble is a game that is hard to score. On one hand, it probably is the best Gintama game we have received thus far as it’s filled with a lot of things longtime fans will recognize. But on the other hand I can’t really recommend it to people who are not already huge fans. I can understand that it’s difficult to cram 400 episodes and 600+ chapters worth of content into a 5-10 hour single player campaign. The game is serviceable enough, but I just wish they were able to present the story and game content in a better way so that both longtime fans and new fans can enjoy it as much as they possibly can. 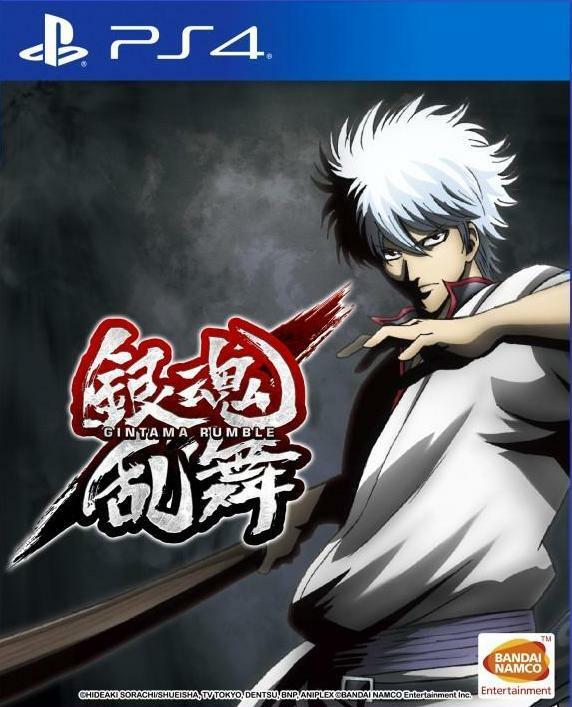 Gintama fans might get a kick out of it especially the Ultimate Rumble mode, but $61.99 is a steep price for this kind of game especially considering some of the issues I noted in this review. That said, I highly recommend checking out the Gintama series as a whole. It’s one of my all time favorites and usually never fails to satisfy me but for this particular game, I’m left feeling conflicted. If you enjoy Musou style games and Gintama you will find something to enjoy and can probably add a half point to this. For everyone else, proceed with caution. Review copy provided by Play-Asia. If you would like a copy for yourself, please use our affiliate link below.